To detect whether a player is gambling irresponsibly, we total the amounts won and lost over all games played in the last 24 hours. If this amount exceeds 500€, we generate an alarm – but since we don’t want to spam our players, we only do so if the previous alarm was more than 24 hours ago. The projection takes all GameWon and GameLost events from all Player streams as input and stores all games from the last 24 hours in its state. 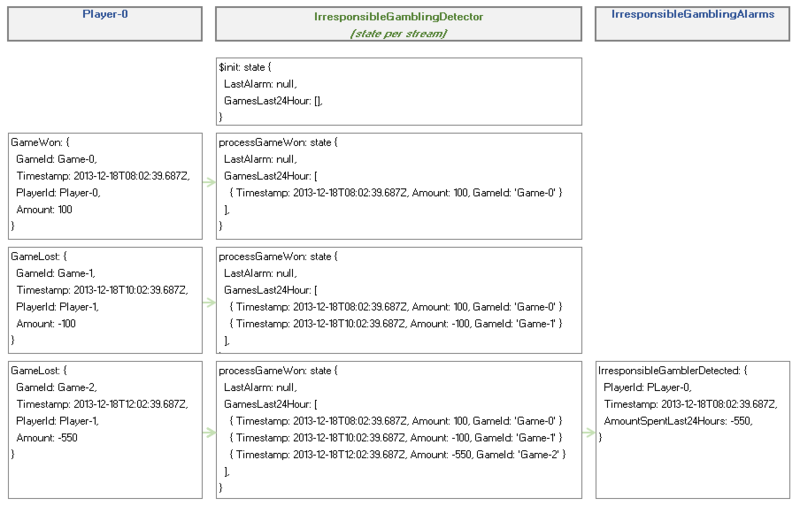 When the amount of money a player loses exceeds 500€ in a 24-hour span, it generates an alarm by emitting an event to the IrresponsibleGambleAlarm stream. The init method generates the initial state, which contains the timestamp of the last generated alarm and an empty list of the games that player has played in the last 24 hours. The processGameLost and processGameWon methods process the corresponding events. First, they update the list of games played in the last 24 hours, removing games that were played more than 24 hours ago and adding newly received games. Next, they check whether an alarm was generated in the last 24 hours: if this is the case, processing halts immediately. Finally, they calculate the total amount won or lost in all games over the last 24 hours, and if the amount lost exceeds the threshold, then an IrresponsibleGamblerDetected event is emitted to the IrresponsibleGamblingAlarms stream. Since we can only guarantee that events are processed at least once, we also have to ensure that our projection is idempotent. We need to check whether an incoming event has already been processed, or else we’ll get strange results if we process the results of the same game twice (or more). By storing the GameIds of each game we process in the state, we can determine whether we’ve already seen a specific game or not before we process it. This definition indicates that the projection is only interested in GameLost and GameWon events from Player streams. To test the projection, we’ll define four scenarios. The first will test a lost game, but without exceeding the threshold, so no alarm will be generated. The second will assert that an alarm is generated when the threshold is exceeded. The third scenario will also exceed the threshold, but in more than 24 hours, so no alarm will be generated. The last scenario will check for event duplication. Once again, we see the power of event processing testing. We can arrange messages in the past and future without any issue. Since we want to send email and text messages based on the output of this projection, we’ll be implementing a projection in C# to handle the alarms.